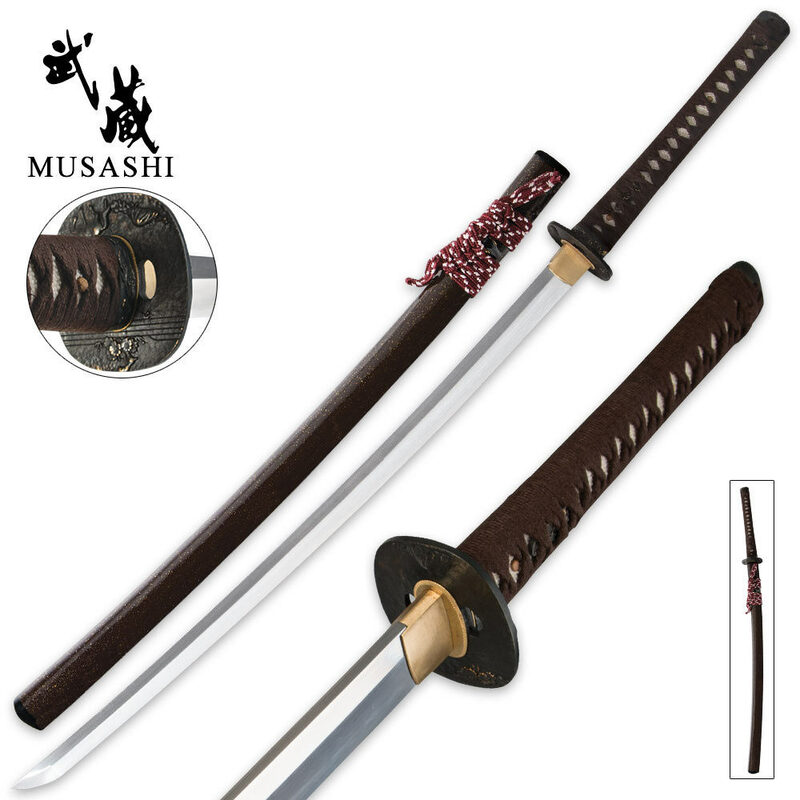 Musashi Dark Stallion Katana Sword 1060 Carbon Steel | BUDK.com - Knives & Swords At The Lowest Prices! 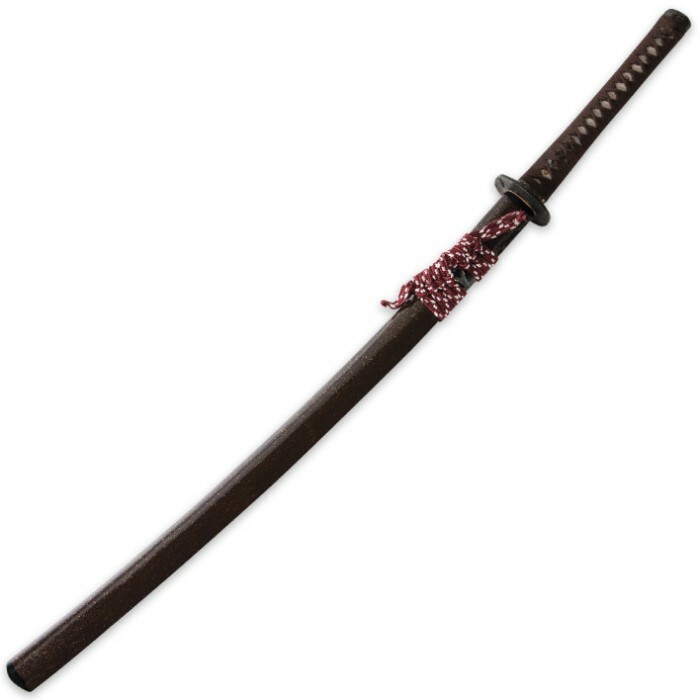 This Musashi Dark Stallion Katana sword features a hand-forged 1060 carbon steel blade that has not been fullered. The fullering process, sometimes called a bo-hi or blood groove, reduces the weight of the sword and allows for more nimble use of the sword. Thus, this sword is much heftier and can slice through thicker bamboo stalks because of its weight. The blade has also been clay tempered to produce a real hamon line and a blade hardness of 55 HRC. The full-tang blade has been double bamboo pegged to the hardwood handle for a truly battle ready sword. I bought this exact same sword 7 years ago. They had it named Speckled Rose Burgundy or something like that. Still as perfect 7 yrs later. Very good blade, tough, back yard beater and then some. Super nice sword. I ordered this sword just a few days ago, and it came in the mail today.I was so excited for it, but when I got the sword, I noticed the Tsuba is rattling and slightly loose. I do not know what to do with it as of now , but I sadly don't trust it to stay together when I try to swing it.I suppose I will just use it as a display sword. I hope Budk can do something about this. I just got this today. I love it. It came sharp. All the fittings are tight, no imperfections and it just feels great holding. It isn't as heavy as I expected it to feel but that isn't anything negative. With a little polish it came out looking amazing. I recommend this to anyone looking for a good sword without wanting to spend a ton of money for. You won't be disappointed. Musashi makes nice swords. They are not the top of the line, but neither are they the low end of the spectrum. I have four other swords of theirs and I have been happy with them all. This sword was no exception. :-) I got this one for several reasons. One, it is not black. The brown Tsuka with the speckled brown Saya is a nice change of pace for my sword rack. Secondly, it is my first non-fullered sword. It has a nice heft and cuts very well and still makes a satisfying Tachikaze when swung correctly. All the fittings were solid and tight. The Hamon is beautiful. The pictures here do not do this piece justice. For the price, you cannot go wrong. Catch it on a 20-30% sale and you have a real steal. Wow! Great sword for not a bad price! Katana fits tightly in the saya,no rattle. Tsuka is wrapped tight,and in the correct way. Hamon is visible and unique. Fittings are solid and well made. Blade is polished well. This is just a great all around stater sword,or beautiful display item. This katana... This Katana... is my Favorite from True Swords, I love how it is made, it is well put together, and pretty sharp (not quite as sharp as i like mine) But it is sharp. I love the design on the tsuba, it is beautiful artwork, as well as the antique finish. I love the clay temper design, it is beautiful also. I am very well pleased with this sword, thank you so much True Swords and Musashi! This is lighter than my other 2 katana, and i quite like that. I love the cotton cord wrap color and feel as well as the speckled burgundy saya. I am immensely pleased with my purchase, thank you again! Colors are a little ugly but that's just my taste, I liked the looks of the tsuba on the speckled burgundy over the bamboo without bo-hi so I went with it. Very happy with my purchase, beautiful sword, lighter than I expected actually. I also have a Ryumon phoenix but I got this to beat around. The phoenix is quite a bit heavier even with the bi-hi. The blade on this sword is a tiny bit more narrow. Not sure witch one I'd rather have in the zombie apocalypse. Lighter and faster go a long way. Mine arrived razor sharp, easily cuts paper. Shipping was fast, ordered Mon, received Thursday. I will definitely be buying more swords from here. Happy customer. Loose Tsuba, washers on both side of Tsuba are bent out away from Tsuba, flat spot on blade, bamboo pegs through tang are WAY to long...DISPLAY ONLY, worth $50-$75 NOT 109! Response: Thank you for alerting us with the quality issue with this product. We have contacted the vendor and are performing a quality control check to ensure we do not have any other unacceptable products within this item number. We will also be happy to refund your money or send you a replacement sword if you will contact our customer service department at 800-735-3326.